Fantastic lakefront property with two additional lots across the street! This is a rare find with all three lots totaling .87 of an acre! This main-lake property is located inside the no wake zone. 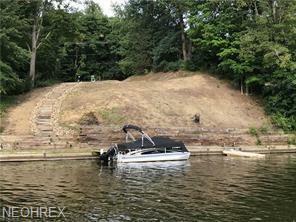 This lot is ready for you to enjoy from day one with a gravel driveway, steps down to the lake, seawall, dock, and water tap in already in place. These improvements save you $20,000+ by having them done already! You will want to make sure you are back from one of the two heated pools that Roaming Shores has to offer for the fantastic sunsets that the east side of the lake offers! Call today for your tour of Roaming Shores and the future site of your new lake home!